To put it simply - Grace & Greens is a free community meal that happens at the Okra Abbey every Wednesday at noon-- but for many it's also much more than that. Grace & Greens is a precious time to come together, lift up our joys and sorrows in prayer, break bread, and enjoy fellowship over conversation, laughter, and fresh vegetables grown at the Okra Abbey. Through this time of gathering together barriers are broken down over the common table we share and unique connections are formed. Grace & Greens aims to cultivate community and unity through the portal of one of New Orleans' favorite pastimes: eating. Peas & Love is a ministry of Okra Abbey that delivers fresh vegetables in handmade bags to homebound folks in the neighborhood. 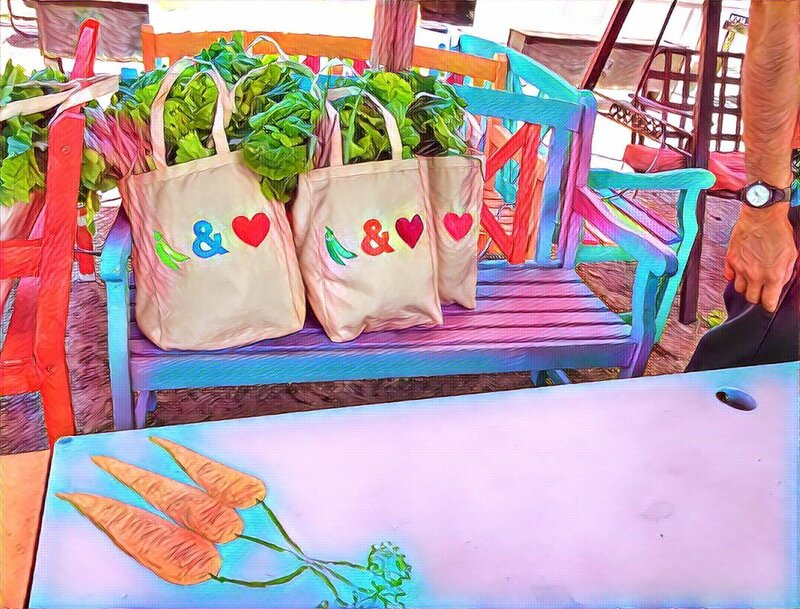 Full of fresh, nourishing vegetables, the bags are hand delivered every other Tuesday to people in the community who are otherwise unable to attend Grace & Greens or access fresh produce. Peas & Love provides the opportunity to not only share the food we grow in the garden of the Okra Abbey, but also to create relationships and offer a pastoral presence to our neighbors in the community.